Born in the capital city in 1880, Scotland’s own Sir Russell Flint apprenticed as a lithographic draughtsman from a young age while studying at The Royal Institute of Art before becoming a medical illustrator as a student at Heatherley’s Art School in London. Thereafter, he studied at the British Museum and became an artist for The Illustrated London News from 1903-07. As well as this, he produced illustrations for books including Chaucer’s Canterbury Tales. 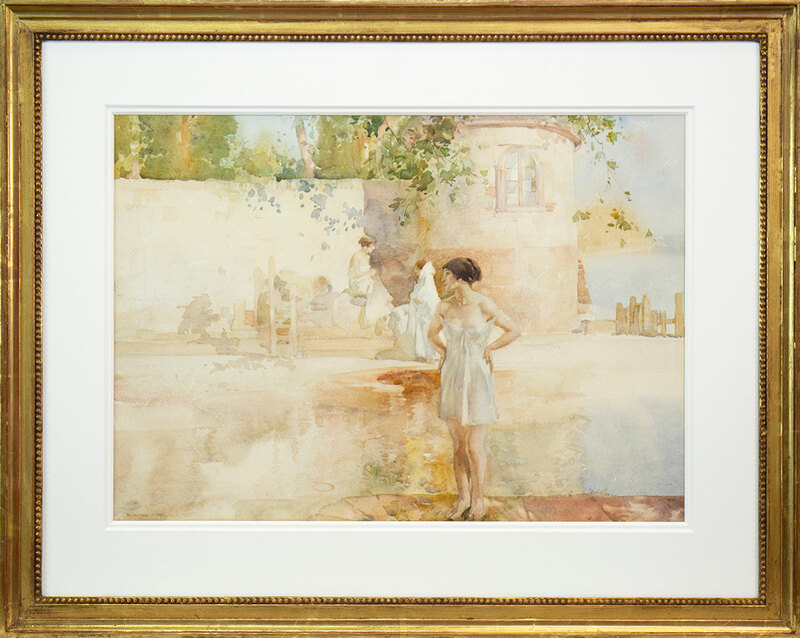 However, Flint is best known for his watercolour paintings of women – one of which features in the upcoming British & International Pictures Auction on 21 November. Lot 448 evokes a subdued calmness that Flint’s watercolours were famous for. Painted in tawny hues, the sitter poses in the foreground with hands on hips and looking towards the right. At this time, post-WWI, Flint’s artistic career really began as he decided to become a full time painter and moved away from illustration. Leaving London, he spent time in France and Spain where he produced artworks that reflected the local scenery and culture. The figure in lot 448 has been treated in a realist manner, recalling his work as a medical illustrator earlier in his career. Flint has contrasted this with a looser hand in his treatment of the watercolour surrounding the figure. The way in which the water at the bather’s feet has been painted makes use of the subtlety of the medium with the visible brush strokes conjuring ripples and the ebb and flow of water. Behind the figure, two bathers have been painted in a barely-there way allowing for the main figure in front to take precedence. In their white cloths, the figures dry themselves off in the sun. The pale glow of the painting suggests a peace and tranquillity that Flint has captured perfectly. This unique method was reverberated in many of his works at this time. Lot 448 has an auction estimate of £8,000–£12,000. Come along to the Valuation Days at McTear’s on Tuesday, Wednesday and Thursday this week for complimentary auction advice.